If your business handles cash, you’re bound to be familiar with the issue of counterfeit banknotes. Financial loss and the level of annoyance add nothing but headaches to your day. To help reduce the number of counterfeit banknotes being accepted, the Bank of England has just launched the Banknote Checking Scheme, an initiative promoting banknote checking at point of sale. The idea behind the initiative is a sound one: if you and your staff are able to spot fake notes reliably, you can deal with them before they become a problem. And if your business supports the scheme, you pledge to help put counterfeiters out of business. The scheme is free to join, and any retailer or business can sign up. The scheme focusses on training sales staff to recogne counterfeit banknotes and on gaining cooperation from retailers. Since the launch of the Scheme in October, the Bank of England has received pledges of support from over 60 organisations including some well know high street brands. You can find out more information about the Scheme on the Bank of England website. 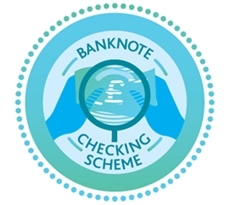 Or download the brochure outlining the Banknote Checking Scheme by clicking here. For additional information, you can contact the Bank of England Notes Directorate on 020 3461 7730, who will be happy to arrange a meeting to discuss how the Scheme might benefit your organisation. The team will also be hosting a webinar Thursday 17 May at 11.00am,which explains more about the scheme and provide an opportunity for you to ask questions. Don’t let counterfeiters affect your business.